Recognizing the accomplishments of our colleagues at the annual Credo Champions Event. Lots of companies give awards to their best employees. But here at Citizens Bank, we do it big. More than 275 Credo Champions and their Leadership Team celebrated the night away at the annual Credo Champion Event at Gillette Stadium in Foxborough, MA. 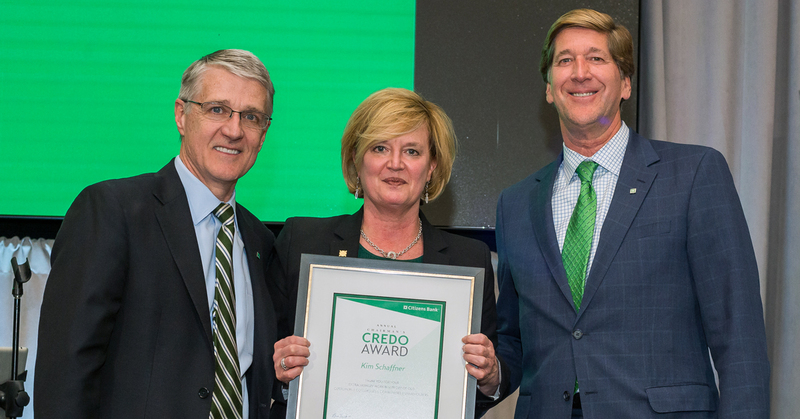 The Credo Award Champions are colleagues that are nominated by their managers for their dedication and contributions to our customers, colleagues, communities and shareholders. Every last detail was planned out to make these Citizens Bank superstars feel appreciated for going above and beyond in their jobs every day. For some Credo Champions, this meant it would be their first airplane ride or first awards ceremony. Volunteers were ready to greet and cheer on these champions when they arrived at Boston Logan International Airport or their hotels and throughout the event. The night kicked into gear when Credo Champions walked onto the field of champions at Gillette Stadium. Senior leaders, including Chairman and CEO Bruce Van Saun, were waiting for them to give high fives, hugs and green beads. The memorable night included a behind-the-scenes tour of the stadium, seeing their faces on the 164-feet-wide Jumbotron, being honored at the Credo awards ceremony, games, dinner, and dancing the night away. Learn more about life at Citizens, our culture of recognition and why we acknowledge our exceptional colleagues.